Way before the days of social networks, I fondly remember wasting hours on end chatting with my mates on instant messengers. Through my teenage years, they became crucial to my existence and instrumental in nurturing my friendships as well as my first relationship. That’s probably why ‘Emily is Away‘, developed single-handedly by Kyle Seeley, struck a chord with me in just fifteen minutes. The interactive story sees you play a teenager exploring your relationship with Emily, a fellow high school student, through an old-school chat client. The interface feels weirdly familiar as you log on, choose an avatar and select dialogues to advance your conversation — but it goes far deeper than that. Between the awkward small talk about how we were spending our days and more pressing questions about how we felt about going away to college and why we hadn’t become romantically involved, I was transported right back to a time when relationships were an enigma and a decent GPA was just a distant dream. Each conversation lasts only a few minutes and you can play them again for various outcomes before you move on the next one. How things go with Emily is entirely up to you. I only managed a single playthrough, but I’m already thinking about when I can give it another try and hopefully win Emily’s heart. 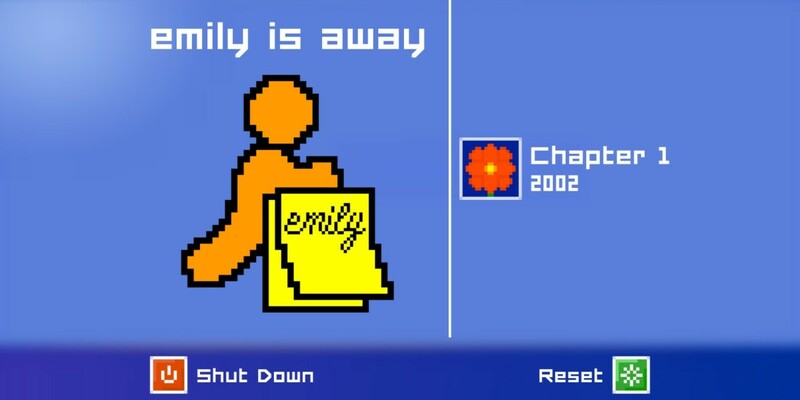 Emily is Away is available for Windows, OS X and Linux, and you can decide how much you’d like to pay for it.